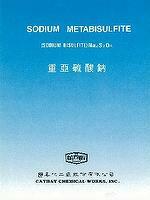 Taiwan sodium metabisulfite manufacturers.Sodium Metabisulfite is free flowing dry white uniformly crystalline powder. It's solution is called sodium acid sulfite or sodium bisulfite. It is also named sodium pyrosulfite. Sodium Metabisulfite is a convenient source of sulfur dioxide and widely used for a variety of applications.- Sodium Metabisulfite is widely used as an Anti-chlor in textile industry and as a bleaching agent in the preparation of wood pulp.- It can be used for preserving foodstuffs, as a preservative in manufacture of silage.- In photography it is used as reducing agent of developing.- In organic chemistry it is also used for manufacture of acrylic fibres, and in production of viscose rayon.- It confers additional water solubility on dyestuff in the manufacture of certain dyestuffs.- In food industry it is used as a preservative agent.- It is used in tanning industry and pharmacy industry.- It is ued for water treatment.- Also it is used for raw rubber production from latex. Reliable sodium formaldehyde sulfoxylate manufacturers. Taiwan sodium formaldehyde sulfoxylate manufacturers. CATHAYLITE-C is Cathay&apos;s brand name of Sodium Formaldehyde Sulfoxylate. It is a kind of white crystal in form of irregular lumps or in rice size, and powder. - The principal use of CATHAYLITE-C is a powerful and stable high-temperature reducing agent for vat dyes in printing and dyeing processed. - It is used for discharge printing to give clear, sharp white or colored discharges on dyed grounds. - CATHAYLITE-C is also used for stripping of dyed fabrics. - As a delayed-action coagulant for rubber latex and as a reducing component of redox systems in emulsion polymerisation reactions. - Also used as a main auxiliary agent for synthetic rubber manufacturing. Internal sodium hydrosulfite manufacturers offer stable and reliable items.Taiwan sodium hydrosulfite manufacturers.Sodium Hydrosulfite is commercially known as "Hydro's or Hydrosulfite", it is a free flowing, dry, white uniformly crystalline powder.- Hydrosulfite is used extensively in the textile industry for vat dyeing, reducing cleaning, printing and stripping.- Sodium Hydrosulfite is also used as a bleaching agent for textile materials, such as silk, wool, and nylon, etc...- It can be used to bleach foodstuffs such as glatin, sugar, honey, wine and vegetables, etc...- It is also used for bleaching miscellaneous substances, such as soaps, oils, fats and china clay.- The preparation of dyestuffs and pharamaceuticals uses Sodium Hydrosulfite as reducing or bleaching agent.- Sodium Hydrosulfite is used as bleaching agent for woodpulp.